Auger-type turners are like a plow with an auger in the bucket. These windrow turners come into different sizes and break the pile up with each turn. And it is often used in composting organic fertilizer. 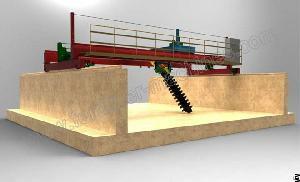 Compared with other type compost turning machines. Auger-type turner has the prominent feature of its turning depth. Compost Turner is key fermentation machine in dealing with livestock dungs, crop straws, saw dusts, sludge and other organic waste. As a new fermentation machine, it has a long way to go. But its prospect can be seen in the rapid development of fertilizer plant. It has replaced manpower or forklift to become a necessity for turning organic material. Company Name: Azeus Fertilizer Machine Co., Ltd.